After the Papaki Tai concert in Kocaeli I met up with my friend Sebastian. We had met playing in the New Zealand National Youth Orchestra years ago, but now he was studying towards a Master of Visual Anthropology in Denmark and was keep to do some preliminary work for his thesis in Turkey. The original idea had been for him to film the Papaki Tai project itself since Seb was interested in making taonga puoro a focus of his research, and to observe the residency as well as the way in which the Turkish players responded to the Maori instruments. However, shifting schedules meant that Seb would arrive too late to document the project. Nevertheless, we resolved to meet up anyway and see if we could find something to for him to film. 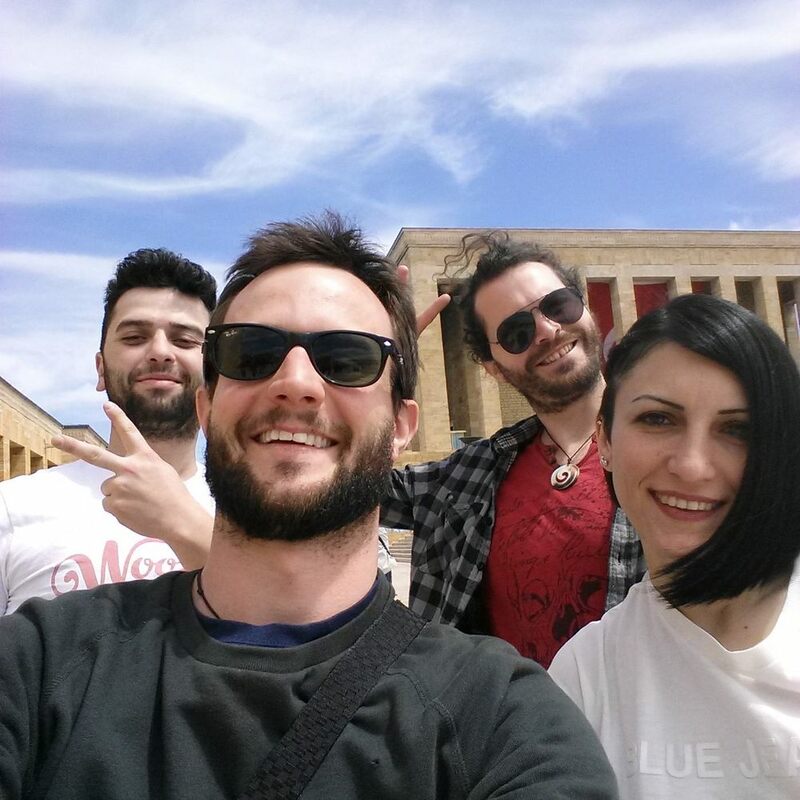 We met in Izmit and I brought him up to the Helikon art centre to meet Orhan and the others. Through the course of the evening some contacts were suggested in Rize, as well as some contacts in Cappadocia in the middle of the country. We decided to leave the following day, resolving to hitch to Ankara, where we had arranged to couchsurf with Mert and Dephney. Heading down to the road to what we both thought was a good spot, it quickly dawned on us that each of us had assumed that the other had been hitchhiking before and knew what they were doing, when in fact neither of us had a clue and we had in fact chosen a terrible spot. A small crowd of Turkish men had accumulated behind us and were laughing gently at our naivete. They then directed us to the bus station, which as it happens was only 10 meters away. The bus to Ankara only cost about NZ$25 so we decided to take the easy road out. Mert and Depheny met us at the station in Anakra, then shouted us to dinner at a local restaurant and also took the time to show us a few local bars. The following day was ANZAC Day,the 100th anniversary of the day when Allied forces in World War 1 invaded the Gallipoli Peninsula in order to try and take what was then the Ottoman Empire out of the war as quickly as possible. At the forefront of the invasion were the Australian and New Zealand Army Corps (ANZAC), who spent months of bloody fighting as part of what was ultimately a disastrous failure for the Allies. However, for the ANZAC's invasion has become part of our national mythology and is now the day of remembrance for all war dead from Australia and New Zealand. For the Turks however, the defence of the Peninsula marks a great victory on their road to independance and the birth of the modern Turkish State. Fittingly then, while thousands of Aussies and Kiwis were at the dawn ceremony at ANZAC cove, Seb and I made a trip to the Ataturk Memorial museum to learn about the man who one hundred years earlier had been our ancestor's adversary. Seeing this part of history from the other side was incredibly eye-opening. For the Turks the day was not as significant as it is for ANZACs, their Independence Day a few days later was more important, however a humbling gesture of respect was made by the flying of lanterns from the memorial the previous evening. Later that day we made our way to Orashiar in Cappadocia, where a friend of Mesut (the cook at Helikon Art Centre) had agreed to let us stay in her home while she was away. We were dropped by the side of the motorway managed get a ride into town. Her home was in fact constructed from one of the many caves that exist in the region, however it had been set up with all the necessities of life and was incredibly homely. We were given the keys by our neighbor, Ersin, a toy maker from Istanbul who had made the move to Cappadocia in exchange for a simpler and less crowded lifestyle. Ersin was a woodworker and toymaker, and we talked to him over dinner about the project I had just completed in Kocaeli with taonga puoro. He was really interested in the instruments so we talked about the possibility of him constructing a koauau (Maori flute) using information from the sources we had (mainly Brian Flintoff's book Taonga Puoro, and Rob Thorne's Thesis on the construction of koauau). He agreed that we should come to see him in his workshop the following day. Exploring the area the following day we explored the area and were over-awed with the landscape and the general feeling of the area. Our contacts in Rise were still half the country away, and we only had a limited amount of time we had left in Turkey. So with that in mind Seb and I made the difficult decision to stay in Cappadocia and make the most of the area rather than sprint across the country to the black sea where we would only be able to spend a couple of days before heading back to Istanbul. Inspecting a Satz in the workshop. Arriving later in Ersin's workshop, he showed us some of his work (which you can look at here:) and explained to him (to the best of our knowledge) how a koauau is constructed. It turns out it was pretty simple to make, especially with modern tools, and we had a working flute in no time. After a bit of further exploration and documentation around Ortahisar, we walked for an hour to Goreme, which seemed like another world. Being surrounded by people speaking English (a lot of Aussies and Kiwis had just come that way from the ANZAC commemorations) after the laid back atmosphere of Ortahisar where almost no-one spoke english came as a shock. It felt like another world. Seb and I got the bus after which we would part ways as I was going back to Kocaeli to catch up with my friends in Imzit and Bahçecik, and Seb would continue on to Istanbul. After a couple of days back at the Helikon Arts Centre, I made my way back to Istanbul. Returning to this city after the emptiness of Cappadocia as mind-blowing. After a few days catching up with friends from the residency, I then made my own trip trip to Gallipoli, where I had learned that a great Uncle of mine had actually fought in the ANZAC Campaign and survived (only to be killed a few months later at the Somme). Before heading back to normal life in London. It's pretty amazing that given that we invaded their country all those years ago, that the Turkish people decided embrace to reconciliation rather than hold a grudge and name a beach after us. I'm not entirely sure New Zealanders would do the same. But I think a lot of us in the world today can learn from that.